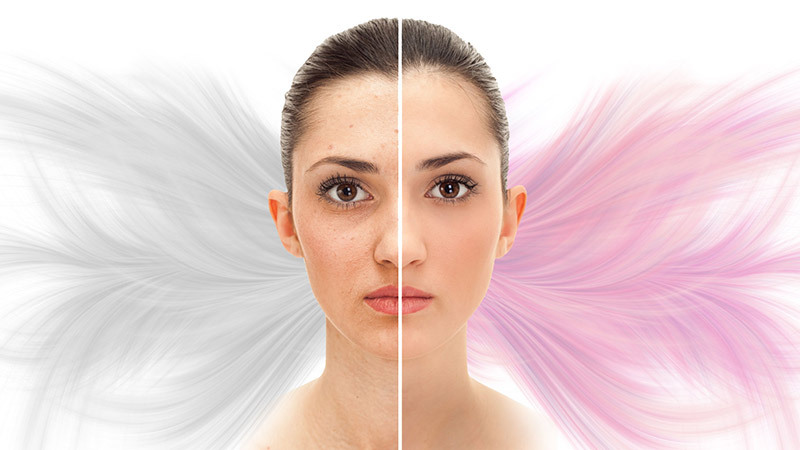 Skin rejuvenation is a process that causes reversal of visible signs of aging. Intrinsic aging reflects the genetic background of a person and results from the passage of time. It is inevitable and beyond voluntary control. Extrinsic aging is caused by external factors such as sun exposure, poor nutrition, smoking, excessive use of alcohol. These can be reduced with effort. So this process is not inevitable. Aging changes occur throughout the three layers of skin i.e epidermis, dermis and sub-cutaneous tissue and are more pronounced in the dermis as compared to the epidermis so the treatment available should be effective for both layers of the skin. It has been said that 80 percent of facial aging is attributable to sun exposure. Crystal peeling is basically a process in which thousands of circulating crystals are thrown on the skin which result in the removal of superficial dead layer of the skin thus yielding fresh, glowing, healthy skin from underneath. It also enhances patient’s complexion. It can be effectively used for the skin of face and neck. The procedure requires multiple sessions and maintenance after one month. It is a safe procedure and effective on all skin color and types. Chemical peeling is used to treat the aging face as well as improve texture of the skin. It also reduces hyperpigmentation and mild wrinkles. A wide variety of peels are used for this purpose ranging from superficial to deep peels. These include alpha and beta hydroxy acid peels, Jessner’s peel, trichloroacetic acid etc. There are myriad uses of chemical peels in cosmetic dermatology. These are also very effective in the treatment of acne scars, rosacea melasma and photoaging. With good sun protection the effect of a peel lasts for months depending upon the depth of peel.